Home » Posts Tagged "Scarlett Johansson"
The winning hair look at the Oscars 2017 was, without a doubt, Halle Berri with her wildly wonderful au naturel ‘fro, curly assymetrical, a little deconstructed, by her stylist, Castillo, worn with a gorgeous gown by Versace. (A long way from her signature pixie.) Janelle Monåe was a stand out with her jeweled crystal crown by Jennifer Behr and her Elie Saab dress tdf with sequins, beading, crystals and a jeweled choker necklace like no other, kind of Queen Elizabeth modern. Ruth Negga‘s red Valentino dress and ruby jeweled crown by Irene Neuwirth for Gemfields. also rocked on her short hair by Vernon François. Emma Stone, who won the Best Actress Award for La La Land, went for loosely waved hair with a Forties’ Goddess feel, according to her stylist Mara Rosza. Supermodel, Karlie Kloss, also ruled with soft-looking Old Hollywood waves, courtesy L’Oreal, but it was her diamond choker by Nirav Modi that dazzled. Scarlett Johansson‘s statement green necklace by Fred Leighton and fab face almost made up for her oddly swirled rock-billy pompador hair, which did not suit her at all – sorry Scarlett, but please find another hairstylist or listen to the one you have. Time for you to change your look. Michelle Williams on the other hand made her platinum very short crop work for her, which made her another stand out at the Oscars. The scraped back mid-parting styles are flattering to so few. 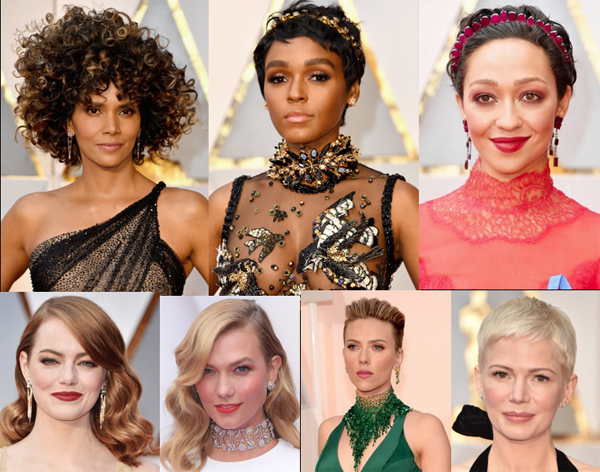 As usual the hair at the Oscars was mostly boring. The same safe old styles year in and year out. Considering the amazing braiding out there, the colorific hair, even if a subtle touch of color, it is sad that the so-called style makers at the Oscars are so, well, ordinary.